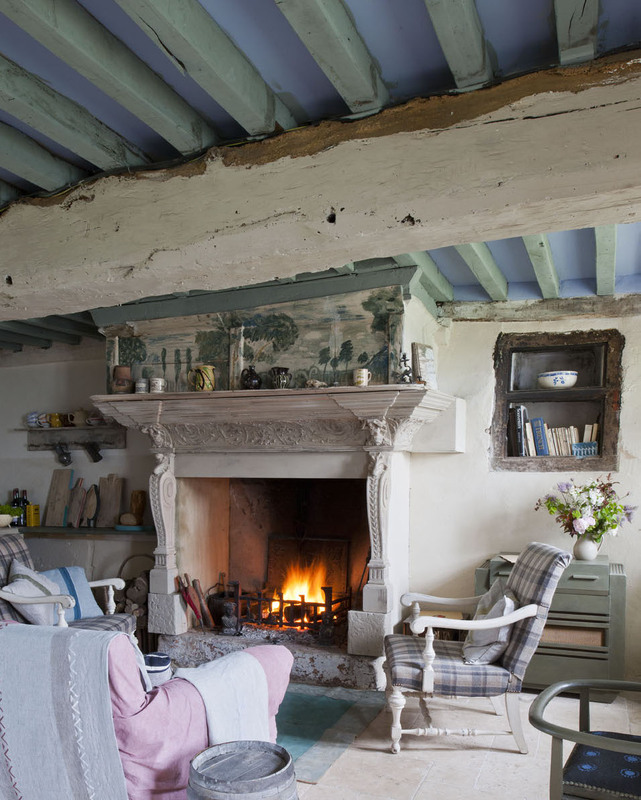 Home › Must have › Fireplaces are the focus of any room! Fireplaces are the focus of any room! "I've always said that the fireplace is THE focal point of a room. Sometimes you can inherit an old fireplace when moving in to a new house and it's easy to forget this as walls, floors and furniture take precedence. Sometimes all that is needed is a change of colour, especially if you're lucky enough to have a fireplace with a detail piece or moulding. To make the most of the luscious and intricate carved detailing on the huge fireplace, which is pride of place in my house in Normandy, France, I painted it with a mix of Chalk Paint® in Country Grey and Old White. To see more projects from my house in France, have a look at my book Colour Recipes for Painted Furniture. Did you know that you can paint marble with Chalk Paint® too? All it takes is two coats of my paint, slightly diluted with water, finished with a couple of coats of Clear Chalk Paint® Wax. 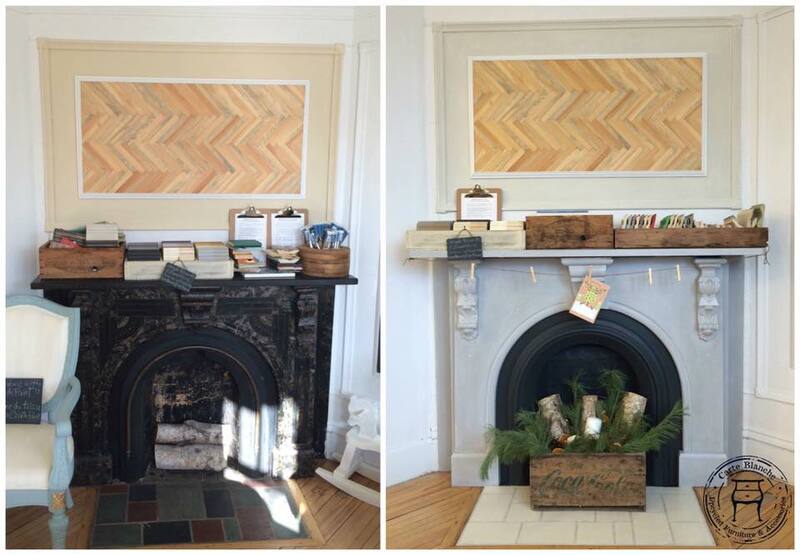 My stockist Melanie who runs Carte Blanche in New Brunswick, Canada, used Paris Grey on her marble fireplace to lighten and brighten this room. 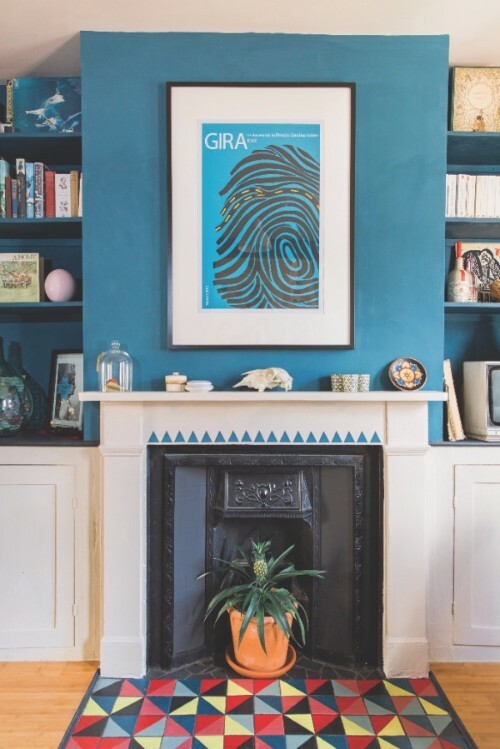 This gorgeous mantlepiece is the focal point in my son Felix's living room and I think it's a brilliant example of how you can give an old fireplace lots of character with my paint! Felix began by painting the mantlepiece with a custom mix of Chalk Paint® made from Country Grey and Old White, ( just like mine in Normandy) and then, with a stencil he'd made out of a card, he painted a row of triangles across the front in Aubusson Blue. He then hand-painted the square ceramic tiles on the hearth in various colours from the Annie Sloan Palette, sealing it with Lacqueronce the paint had dried. 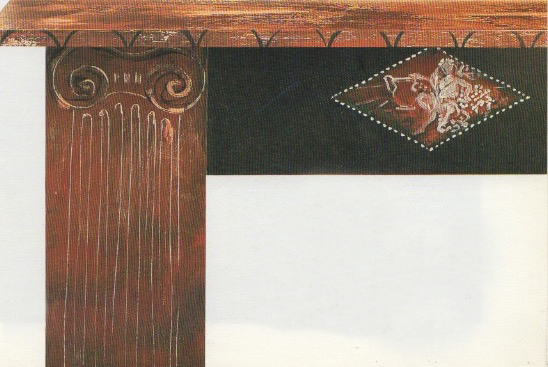 In 1988 I painted this fireplace surround for my first ever book, 'The Complete Book of Decorative Paint Techniques' (published by Mobius International). To add detail to the sides of the surround I used my Sgraffito technique, scratching in to the wet paint with my brush. I still love this piece and I think it shows that even the plainest of fireplaces can be transformed with a bit of paint!" Original Blog Post found at www.anniesloan.com. All content including words and photographs attributed to Annie Sloan Interiors. As well as an extensive range of fireplaces, inserts and surrounds Stax are proud stockists of Annie Sloan Chalk Paint... Need some inspiration? Come on in and see us!